“Migration and Intimacy in the Town of Dollars, Philippines,” Doctoral Dissertation, Department of Anthropology, University of British Columbia, Canada. In Progress. “Taking the Long Route: Ethnographic Metacommentary as Method in the Anthropological Film Practice.” Current Anthropology (Forthcoming, 2019). “Negative Productions during Fieldwork in the Hometown.” GeoHumanities 3.2 (2017): 307-327. “On Identity and Development: Filipino Women Entertainers in Transit in Japan.” Pp. 107-134 in Development in Asia: Interdisciplinary, Post-Neoliberal, and Transnational Perspectives, edited by Derick Nault. Florida, USA: Brown Walker Press. 2008. “By What Signs?” Franz Kaka Gallery, Toronto, Canada, May 2018. “The Women in Our Lives: Response to Perla/Pervize.” Postscript at Artspeak Gallery, Vancouver, Canada, October 2017. 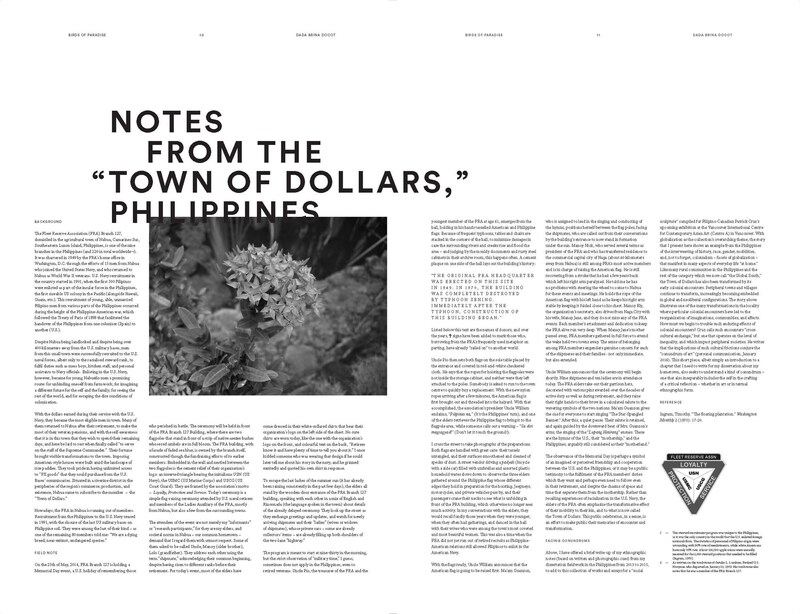 “Notes from the Town of Dollars, Philippines.” Birds of Paradise, edited by Patrick Cruz. Centre A Vancouver International Centre for Contemporary Asian Art, Vancouver, Canada, 2017. “Focus on the Philippines: Films from the Margins.” Visual Anthropology Review 33.1 (2017): 93-96. Community Organization in Tokyo, Human Security Studies-Department of Anthropology, University of Tokyo, Japan. “From Dusk to Dawn: Returned Filipino Women from Japan,” Department of Journalism, University of the Philippines. 2003. To request copies, please send me an inquiry Here.